Brand new for Fall 2010, the Sidi Cobra Boots offer a mid-level price point boot with excellent Sidi Racing Boot functionality. The Cobras are not quite as bulked up as the Sidi Vortice Boots but they offer a load of features, including some that are borrowed from the Vortice and Sidi Vertigo Boot, at an affordable price point. At this point, everyone who has ever been on a motorcycle knows that the word Sidi is synonymous with the highest possible quality in motorcycle boots. No stray from that tradition, the Sidi Cobras are sure to be extremely popular as we head into 2011 and another racing season. Check our full video review of the Sidi Cobra Boots below. The outer construction of the Cobras is Lorica, a synthetic leather that begins as a polyurethane and polyamide blend, is injected with special resins, and goes through a similar tanning process as cowhide, becoming just as strong and resilient (if not more) as real leather, even looking and feeling nearly identical to cowhide leather. 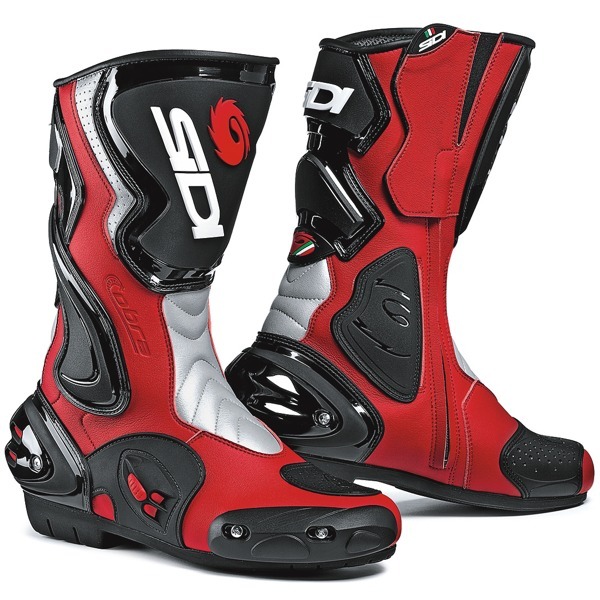 Sidi was one of the first boot manufacturers to utilize Lorica, and the rest of the industry is slowly catching up after realizing the level of quality offered. One of the great features of the Cobra is the integration of Sidi's patented Vertebra System, an Achilles tendon protection system that stretches up the calf. The Cobras further the safety of the back of the foot and ankle with thermoplastic resin ankle protectors and a replaceable shock absorbing heel cup. There is a nylon shin deflector plate to protect the shin which is non-replaceable. But every other hard part that is bolted on is fully adjustable and replaceable. This includes the nylon scuff pads on the toe and the aforementioned Vertebra system. 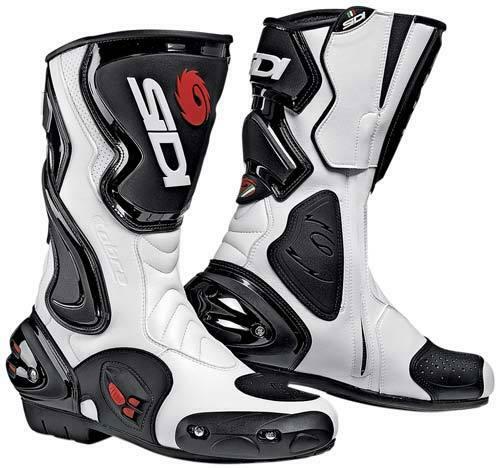 The Sidi Cobra Boots are double-stitched in all high stress areas for durability and the entry to the boot is a convenient zipper pull and velcro closure. There is also an elasticated stretch paneling next to the entry of the boot for comfort and improved fit. Additional features on the Cobras include a DuPont polymer toe shift pad, a Teflon-treated perforated nylon lining for comfort and breathability, a dual compound sole which is protective but flexes, and removable arch support. Sidi decided to come out with an entry-level priced race boot for this season, and honestly, the features of this boot blow anything else at this price point out of the water. It is also available as the Sidi Cobra Rain Boot, which features a proprietary waterproof breathable membrane, and the Sidi Cobra Air Boot, which features fully perf'd Lorica for maximum ventilation. This is another premier boot from Sidi which truly rounds out their lineup, providing an option for the racer or trackday rider not looking to spend 500 bones on a pair of boots.